Shopkick has been on a roll helping bring foot traffic into an increasing number of retail stores with its Shopkick reward system. But while it has been able to get consumers in the door, it hasn’t been able to reliably convert more of those visitors into shoppers and boost the actual purchase amounts. But now, with a new partnership with Visa (s v), it is realizing its full potential by tying into Visa’s payment processing network, helping close the loop on transactions and providing new incentives for users to make purchases. Shopkick, which has 2.5 million users, will now let users link the mobile application with their Visa credit or debit card, which will tie into a new “buy and collect” program. 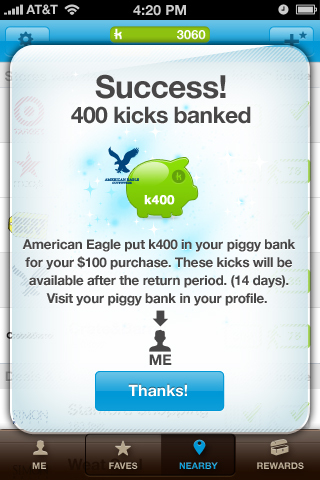 Now users will get kick rewards for visiting a store or scanning an object as well as additional rewards, such as “spend $40 and receive 250 kicks.” Shopkick will deliver notifications to users about offers after Shopkick has established a user’s presence in the store. Visa will use its real-time messaging platform, which it deployed first with the Gap earlier this year, to send a confirmation about qualifying purchases after a transaction. 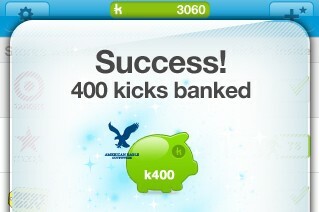 Retailers can also offer kick boosters that increase the amount of rewards if a user buys a certain amount. Shopkick and Visa are implementing “buy and collect” with American Eagle Outfitters (s aeo), Arden B., Old Navy (s gps), Toys “R” Us, and Wet Seal (s wtsla). Shopkick, which is used at 4,000 stores, expects many more of its retail partners to join the program. Shopkick CEO and co-founder Cyriac Roeding said rewarding and incentivizing actual purchases was part of the original plan for Shopkick. Now, with Visa, it is able to create an instant reward and loyalty program for any retailer. The Visa integration can be set up within an hour and doesn’t require that a merchant buy the necessary Shopkick signal equipment that establishes a user’s location inside a store. The goal, though, is to get retailers to sign on to the whole package. For Visa, the most popular credit card, this is another way to provide more help to its retail customers and also drive more transactions for its financial customers. This is also another sign of how the credit card companies can play a big role in providing rewards and can enhance loyalty programs for retailers and merchants. With the Gap, Visa showed how it could deliver targeted offers via text message to Gap customers who opt in based on their location, time of day, spending habits and where they recently shopped at. 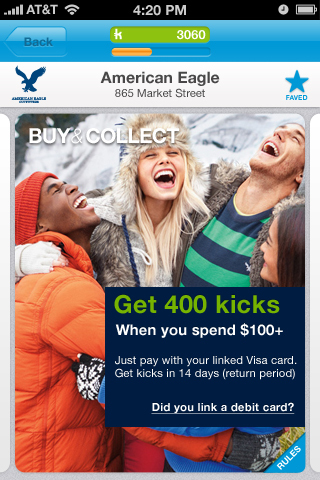 American Express is also experimenting with retail transactional data with Facebook, Foursquare and SCVNGR. Roeding said Shopkick is looking at allowing retailers to tie their current loyalty programs into the Shopkick app, which would allow users to communicate with their favorite stores through the app. 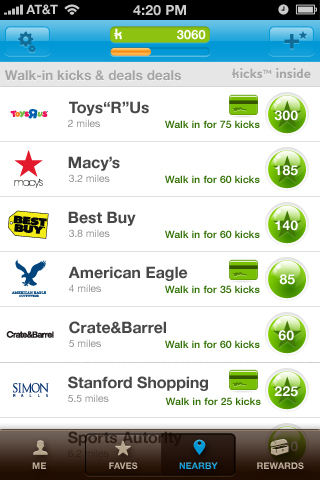 That might help retailers with retention and engagement by working off the Shopkick platform. Roeding said the average Shopkick users open the app 14 days every month, and each day they open the app, they view 16 stores on average. Shopkick is showing that it has a powerful platform for merchants to drive loyalty. But it’s been a little complicated proposition for merchants, who have to install the Shopkick equipment in each retail location. But now, if Shopkick can offer a way to reward real sales and encourage bigger purchase amounts, it makes it easier for retailers to get on board. This is also a way to quickly snag merchants, who can start with “buy and collect” and then move up to the full package. I think retailers should find this appealing. They have a need to drive traffic and sales, and they are increasingly looking to leverage mobile tools like Shopkick, RedLaser and ShopSavvy. But they must have a way to ensure their marketing spend and their mobile initiatives are providing a clear return. Visa is stepping up and showing that with its payment network, it can be the one to not only close the loop but also provide the consumer feedback and outreach necessary through real-time messaging. As we have mentioned, commerce is being remade through mobile devices and various shopping apps. But it can take an old power like Visa to make some of this stuff to come to life.